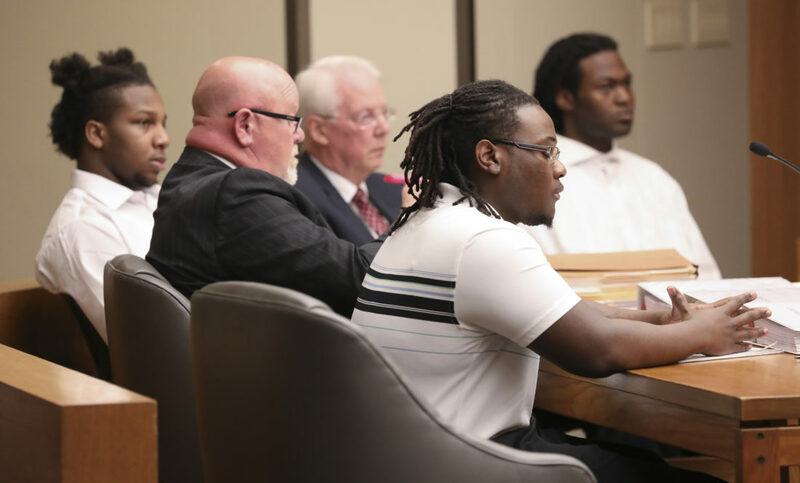 Defendants Tyrone Carvin, front, Shawn Smith, back left, and Ramone Singleton, back right, listen to testimony on Wednesday, Aug. 15, 2018, at the Douglas County Courthouse. 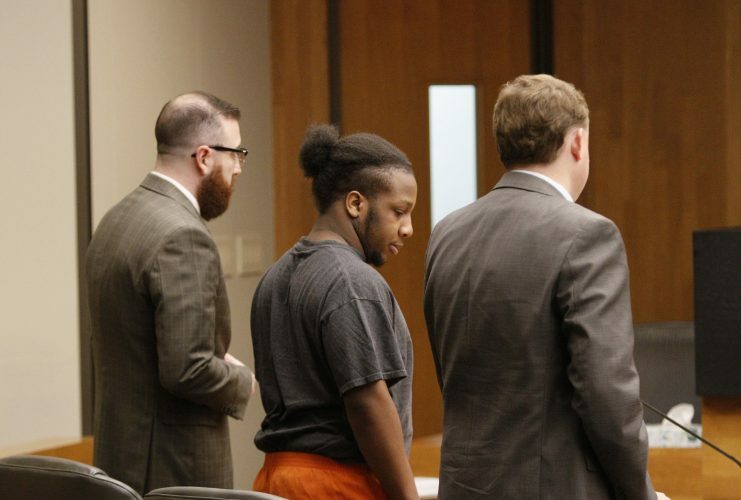 The three defendants are charged with the murder of Cameron Hooks and other crimes in connection with a Sept. 2, 2017, shooting at the North Lawrence Motel 6. Also pictured with the defendants are Gary Long, Smith's attorney, who is second from left, and Forrest Lowry, Singleton's attorney, who is pictured at center. Traffic cameras show the Motel 6 murder suspects’ dark-colored Pontiac Grand Prix coming into Lawrence from Kansas City on the Kansas Turnpike. About 45 minutes later — within minutes of three men being shot inside the motel — the same car heads toward the city limits on another path, bypassing the turnpike entrance and continuing north on North Third Street, according to witness testimony. Testimony about the traffic cameras was among evidence presented Thursday in Douglas County District Court at the trial of three men accused in the shootings, which were deadly for one man. The trial began Monday and is scheduled to run through next week. The shootings happened about 11:30 p.m. Sept. 2, 2017, at Motel 6, 1130 N. Third St. A group of nine men had been partying in the room with plans to go out later when gunfire erupted, killing 23-year-old Cameron Hooks, of Lenexa, and injuring two men from Topeka. A fourth man came with those three men, according to testimony. However, no other suspect has been publicly named or charged, the district attorney’s office confirmed this week. The Grand Prix was tagged and registered to Singleton, and it was captured on cameras coming and going from the area before and right after the crime, witnesses testified Thursday. A records custodian from the Kansas Turnpike Authority found photos of the car getting onto the turnpike at the eastern terminal, near Bonner Springs, but bypassing the kiosk without taking a ticket for the toll road. Photos shown in court also picture the car exiting at the North Lawrence interchange, first pulling up to the self-pay kiosk with someone standing outside the car apparently trying to pay. Apparently unable to pay and hence raise the gate, the car backs up and moves to the K-Tag lane — which has no gate — and drives through, cameras showed. 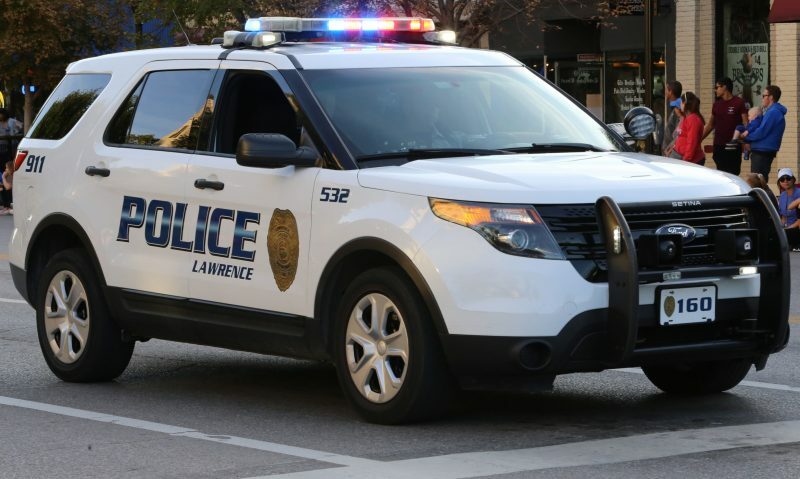 Detective Sam Hiatt of the Lawrence Police Department testified that he searched for and found City of Lawrence traffic camera images of the same car exiting the turnpike and turning south on North Third Street about 10:45 p.m. He said photos from about 11:30 p.m. show the car driving north on North Third Street past the turnpike entrance, a path that would lead to Highway 24/40, an alternative route to Kansas City. Testimony from Wednesday afternoon and Thursday morning also included three alleged victims, though only one was there in person. 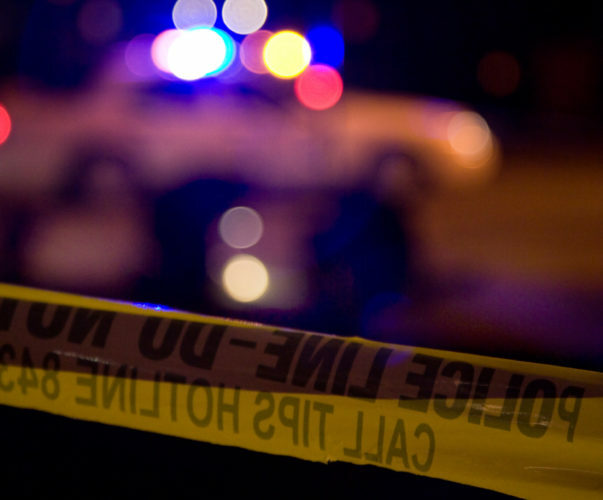 Shooting victim Dominck Frye, on Wednesday, said he didn’t know why the shooting started and described it as the four men from Kansas City suddenly jumping up and firing on the others in the room. Frye said he heard someone yell, “Go, go, go!” but never any angry words or anything indicating a robbery. Frye said he had a gun holstered at his waist that night but never fired it. Frye was shot four times, he said. He said he has two bullets still lodged in his body, was grazed by another, and the fourth entered and exited his right inner thigh. 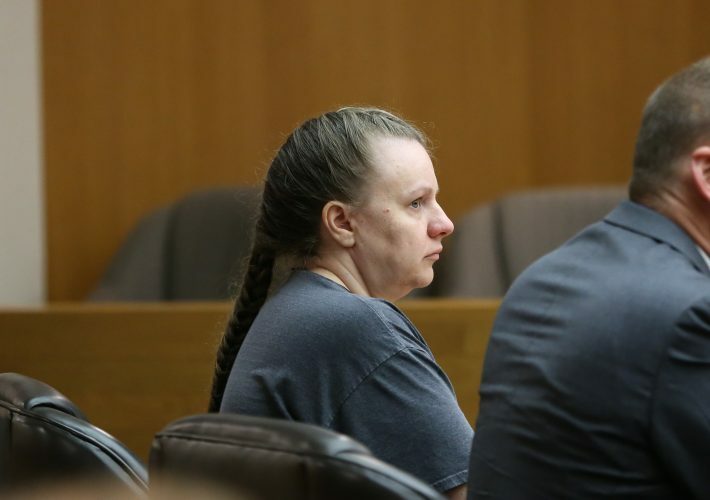 On Wednesday and Thursday, prosecutors and other attorneys from the district attorney’s office read transcripts of preliminary hearing testimony by two alleged victims who can’t be found by the DA’s office to testify. Prior to the trial, Frye told authorities that his friends — alleged aggravated assault victim Tanner Marlow and alleged attempted aggravated robbery victim Mathdaniel Squirrel — were scared, in part because vehicles followed them home to Topeka after they testified in Lawrence in November, according to pretrial testimony. According to pretrial court hearings, Marlow’s father filed a missing person report with Topeka police in April, saying in the report he thought his son had been killed. Squirrel’s ex-girlfriends, relatives, bondsman and law enforcement authorities in multiple cities have told local authorities they don’t know where he is. Jurors were given no explanation in open court about why the two men weren’t there.